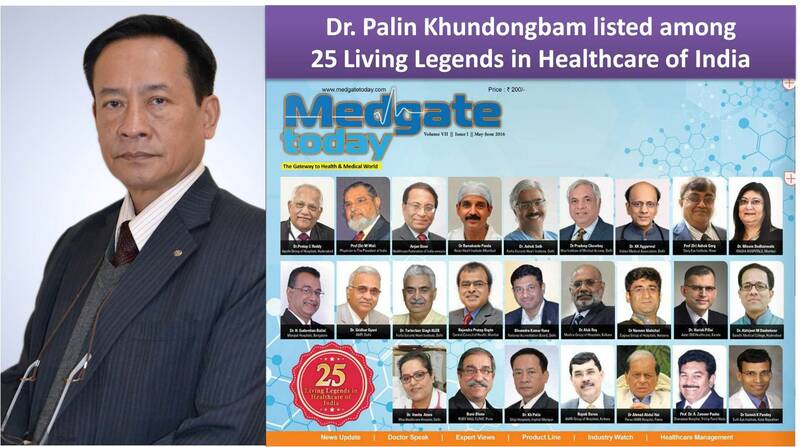 the 25 Living Legends in Healthcare of India by Medgate today in its May – June 2016 edition. 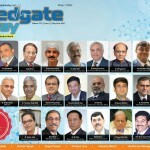 Medgate today is published by Advance Media Group based in New Delhi. 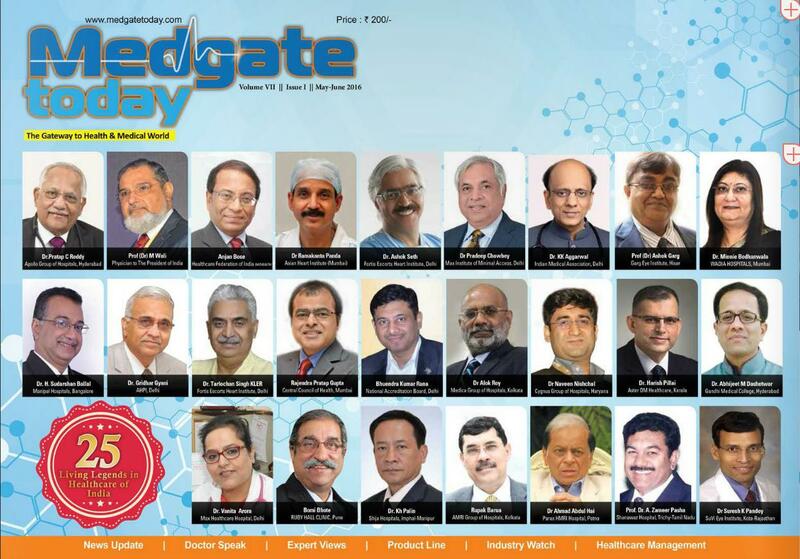 The other stalwarts of healthcare listed among the 25 legends are Dr. Pratap C Reddy of Apollo Group of Hospitals, Hyderabad, Prof. (Dr.) M. Wali of Physician to the President of India, Dr. Anjan Bose of Healthcare Federation of India, Dr. Ramakanta Panda of Asian Heart Institute, Mumbai, Dr. Ashok Seth of Fortis Escorts Heart Institute, Delhi, Dr. KK Aggarwal of Indian Medical Association, Delhi, Dr. Alok Roy of Medica Group of Hospitals, Kolkata, etc. Dr. Kh. Palin is the only one from North East India to be included in the list. 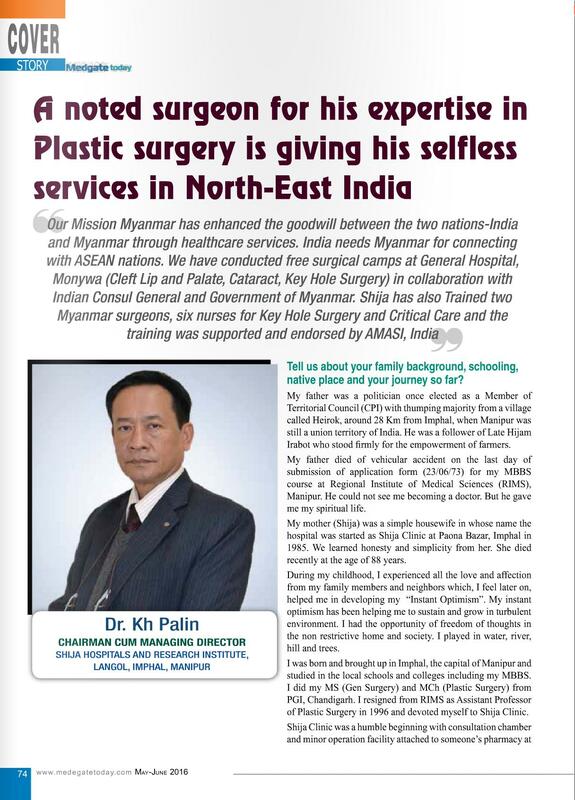 The article in the magazine mentioned about his childhood life, his initiative to bring Manipur in the healthcare scenario PAN India. 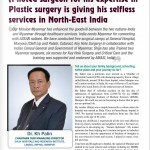 It has a detail mentioned of Mission Myanmar which has enhanced the goodwill between the two nations – India and Myanmar through healthcare services. It mentioned about how Shija Hospitals’ journey has started from a humble beginning when it was a small consultation chamber attached to a pharmacy with a minor operation at Paona Bazar to the current 200 bedded multi specialty hospital. 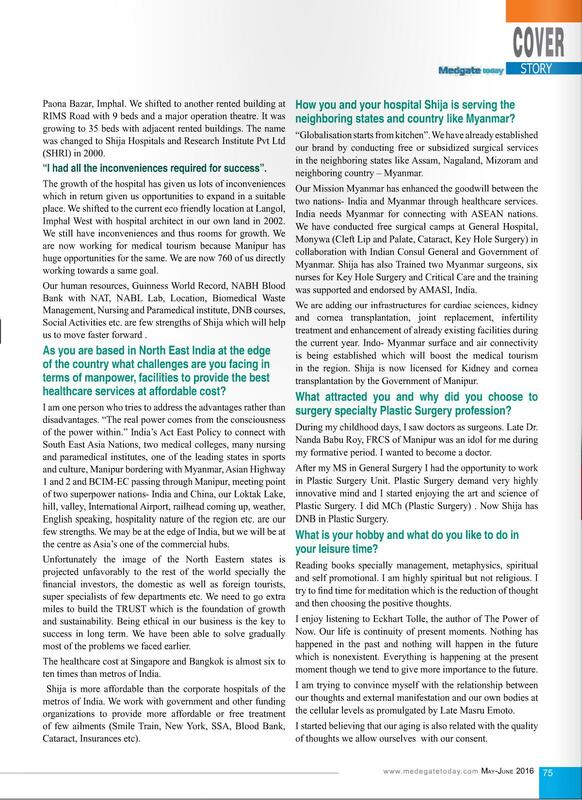 It highlighted on Manipur’s huge opportunities for medical tourism. Khire haidi sum u leire haibaniko, fatte nungside haiba natte. Dear concern people, i m not saying as a doctor,but please go out of manipur see the treatment costs….I m working here in Mumbai right now….a treatment that cost 20-30 thousand rupees in Manipur costs 1.5 lakh in Mumbai…in the same hospital I work right now…you ‘ll say paying capacity is less in Manipur…agreed but also the maintainance of all the instruments is more in Manipur and made worse so by the frequent bandh and blockades which has become a habit of the people of the state’s…so question is not to comdem or support….question is what can be done to change the scenario?….just saying we are poor ‘ll not being any solution…we need to change the mentality….why not go for health insurance, why not we do something to change the work culture of the people. ?..why not we practice healthy lifestyles. …why not we work to prevent the disease? Why not to go for early treatment before disease gets serious…? Why not we do all these small things before things get out of control…? Hope, your salary in Mumbai is triple times higher than working in Manipur because in Mumbai treatment cost is 5 times more than Manipur so. British Proverb, You can make fool to somebody but you can’t make fool to everybody. Another thing is You can Fool to someone for few days but you can’t make fool to him for all the Day. MR. Naubi Hijam,nang se Paisa da yamna chakchaba mallebu … you should work to earn the same way as I do. You know how I work? Do you have any idea? Why is my salary so important to you? Naubi Hijam, i work for excellence, and my expertise would mean so that people like you would not need to go roaming around searching for treatment. My salary is my satisfaction. And money comes with it. Whatever and whoever relative you ve got in medical sciences, go to them and ask…is money more important than work satisfaction and excellence? I bet you ‘ll get the answer straight. Naubi Hijam, i need to remind you a proverb…. Never ask man his income and never ask a girl her age. You need to respect and maintain certain personal privacy when you chat in public forum if you are a gentleman. The money what I earned is enough and sufficient for me. I support and help poor, helpless people and weak people from my own pocket money. I asked you because you write that in Mumbai treatment charge is 5 times higher than Manipur and you are working in Mumbai so I ask you. Understood? Do you know, I am no jealous about your status and earning. Hope, I am senior to you regarding age. Try to respect people so people will respect you. Beyond my earnings, I got lot of things in terms of donations from many rich people around Asia. I am satisfied with whatever I got it is call Happiness. I think Indian Yoga Super Star Swami Ramdev (Baba Ramdev) is richer than any Doctors in India, and than any Bollywood Superstar and richer than 10% Okram Ibobi . Yoga is greatest contributions of India to the World. Baba Ramdev has more than 26 crores followers in India excluding his foreign students. 21st June 2016 will observed World Yoga Day declared by WHO.Now is Real,Past and Future are Dreams. Thank you. Giving is weighter than taking in future. May God bless you. Congrats Tamo, Proud to be Manipuri ! Congrats Tamo and best wishes ! Student – to become a doctor. We take a decade of year to construct a small house. For them they blink their eyes and a bungalow is constructed. Thank you all for criticising me. It gives me Immense energy and direction. I have experienced myself extreme poverty and my whole endeavour is to provide quality affordable healthcare in the region. Shija has already offered the highest number of free and subsidised surgeries in the region. There are many central and state schemes to sponsor the healthcare. Ignorance is our worst enemy. Healthcare is becoming costlier day by day to maintain the quality assurance and safety of the patients and technologies. It is really a global challenge. Shija has 761 direct employment, thousands indirectly. Forefront in nursing, paramedics and past graduate DNB courses in private sector. Please check the cost of treatment in metros . Shija is cheaper though the operational cost (management) is higher in Manipur. inconveniences they face in terms of food, language, man hour loss, travelling expense etc. Thousands are still going outside the state for the facilities not available in the state. More than 400 students are going outside the state for MBBS privately annually. There are more than 700 Manipuri medical students in China alone. Thousands for nursing and paramedical studies outside the state. Manipur is poorer because of economic drainage for healthcare and education. Please suggest us a better option on how to stop the economic drainage for healthcare. In Manipur, many Government Doctors ignore and neglecting their responsibilities. Different flowers with different colors grows in the same garden. Am not talking of any particular Dr. Its in general. As Dr have mention above about the scheme,yes our government has brought up many schemes to help needy people but the question is does it reach to the beneficeries ? No. In Manipur poor people are always left behind. All the schemes benefit are got by near by people,near to the Dr. Or receptionist or those who have many ‘Sanga Panga’. Those who are out of this no way to get the svheme . True story of mine. I have a lot of skin problem(pimples). when I enquire about the Dr. My friends n neighbour told me Dr.tolonkhomba is good. I call up one of my tuition student mother staying in imp. To book a ticket for me as I’m from ccpur. She went at around 6:30 to kwakeithel. Am on my way to imp. On my way she rang me up telling the booking hour is close. She requested the receptionist that the patient is from far place but no chance. Informing to wait in shija he will be coming at around 10am. I reach imp.at 7:20 then went up to shija took the ticket and waited for the Dr. It was in September last year during a big crisis happen in ccpur. Their was curfew and the curfew starts from 12 noon. It was already 11:30 the Dr reach the hospital. I enquire about the hospital timing they told me its 10am but the Dr was very busy earning money at home. I consult him. Its already 12 noon curfew started . I came back from imp- bishmpur dist kangvai by bus,then from their till home 17 km I came on foot as I have to reach home. This is the situation of Manipur. I appreciate you. So, you should try to stand alone independently without support of others. Remember, God help those people who help for themselves. In Manipur, there are many Blood suckers or Parasites or Big Rat, they themselves told that they are Social Workers, Honest, and Local People Lovers. Remember Failures are Pillars of Success, No Pain No Gain, Higher the risk Higher the Rewards, More problems get more experience, God help those people who help for themselves, more desire more pain, Everything is Temporary not Permanent, Health is Wealth and Peaceful of mind is Happiness. I really appreciate what you said……I appreciate you. Let’s see if we do what we talk…as you said silence is better than talking nonsense. Sir, In Manipur I teach Yoga to more than 800 people since October 2013.I provide Ayurvedic medicine to many poor people who can’t buy Allopathy medicine and I make many local people to relieve Back Pain, Sciatica, Knee Pain, Neck Pain, Obesity, eye problems, sleepless and stress without medicine. I am teaching Yoga to different places beyond Kangleipak and to aboard like China, Japan, Vietnam, Thailand, and Nepal etc. How do you arrange free ayurvedic medicines for poor people…if we also can do the same…kindly elaborate how to arrange free medicines to be distributed.? I distribute free of cost only to poor innocent people but from middle class and rich family I took cost of Medicine. Regarding Yoga ask to Dr. Jugindro, every morning he join Muruli, Om Shanti Class at Kwakeithel Moirang Purel, regarding Meditation ask to Dr. Palin, he gives Lecture on Meditation at Hotel Imphal on 16th May in Art of Living class conducted by H. H. Ravishankar. My Yoga students coming to Imphal. If you work hard honestly and seriously, you can grow and God will help you. My younger sister was topper in MBBS and PG at RIMS and my brother in law is only Super specialist in his subject from Manipur. Sir, what is your qualifications and Designation? Congratulation sir with ur new milestones in health sectors. Congratulations sir. You have made us manipuris proud. Keep up the good job. We r proud of u sir as a manipuri..
Congratulations. But kindly suggest some better way to afford by the poor people at your Hospital. Genius like u needs some sacrifices /charity. Thank you all. I cannot do it alone. We don’t need independence. We need interdependence.